From Italy with love! 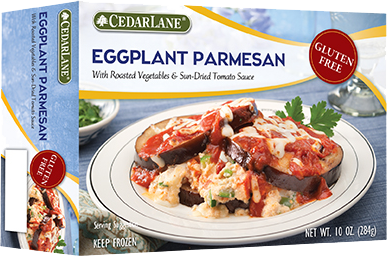 Cedarlane Eggplant Parmesan is the perfect choice for an elegant no-fuss meal. 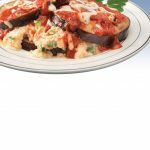 We take lightly roasted zucchini, bell pepper, and onion and natural cheeses and layer them between slices of baked eggplant (not fried! ), then drench everything with a delicious sun-dried tomato sauce. The perfect marriage of great taste and natural goodness! 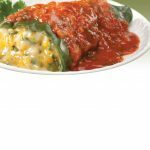 Something new for lunch or dinner! 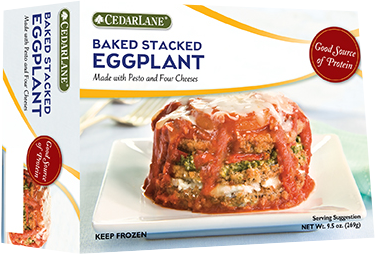 Our Baked Stacked Eggplant is hand-layered with breaded eggplant, four cheeses, pesto, roasted red peppers and slow-roasted tomato sauce. Quick to heat and, most important, great tasting. What more could you ask for? 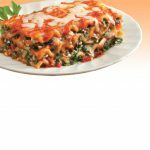 Classic Mediterranean cuisine! 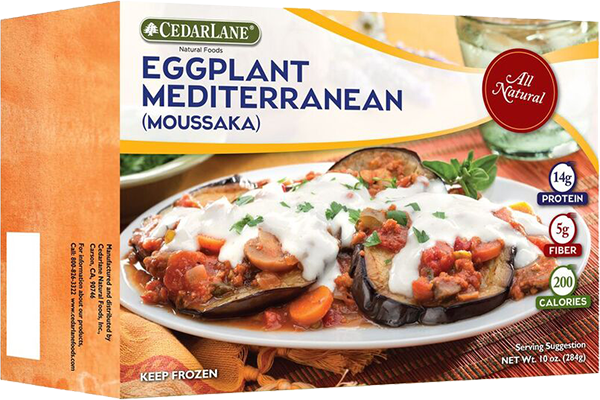 Until now, Eggplant Mediterranean (Moussaka) could only be found in the finest ethnic restaurants. 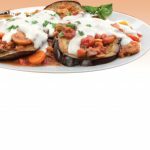 For our version, we start with a slice of delicately roasted, succulent eggplant, then we add a zesty tomato sauce, crisp carrots, sliced mushrooms, red bell pepper, feta cheese, and a medley of fresh herbs and spices. Next, we add another slice of roasted eggplant and continue to stack more fresh ingredients one on top of the other. 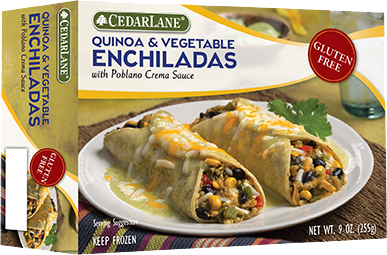 Finally, a creamy Mediterranean white sauce is added for the finishing touch to the top of this delicious entrée. 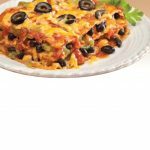 Old World recipes are nothing new to Cedarlane! Harvest something wonderful! 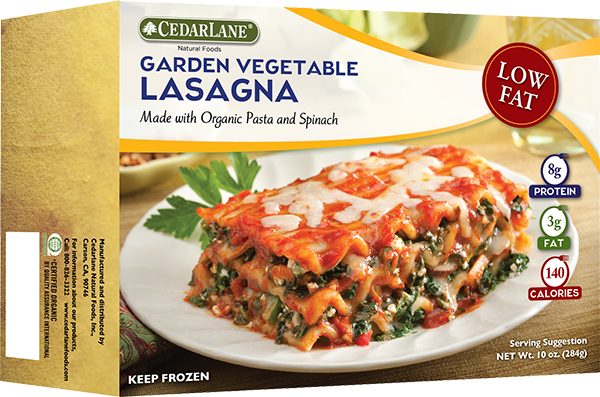 Our Low Fat Garden Vegetable Lasagna made from certified organic ingredients features organic spinach and natural cheeses, layered between organic lasagna pasta and perfected with a delicious sauce made from organic tomatoes. It doesn’t get any better than this! ¡Olé! 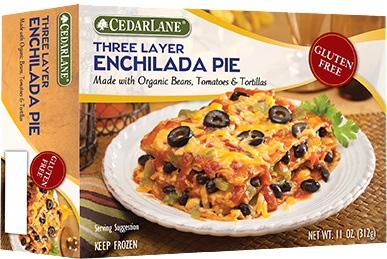 Cedarlane Three Layer Enchilada Pie is an exciting option for Mexican cuisine – made with certified organic ingredients! 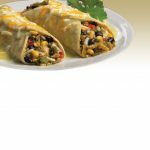 We take layers of organic corn tortillas, organic black beans, green chilis and cheddar cheese and cover them in a delicious salsa-style sauce with fresh cilantro and chunks of fresh tomato, topped with black olives. What a meal! Big flavor is in the house! 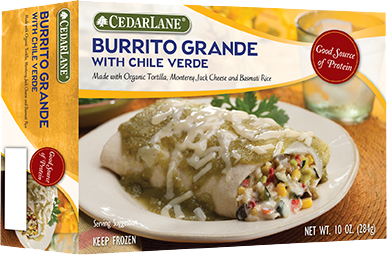 Our Burrito Grande with Chili Verde Sauce made from certified organic ingredients features an organic flour tortilla wrapped around a delicious filling of organic Monterey Jack cheese, organic basmati rice and vegetables and smothered in a chili verde sauce made with organic tomatillos. From our casa to yours! 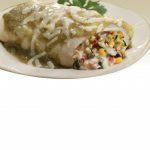 Taste the authentic flavors of Mexico! 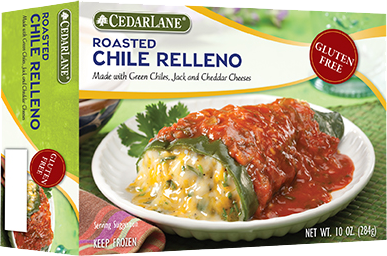 Our stuffed Roasted Chile Relleno starts with a mild, heart-shaped poblano pepper that is fire-roasted to perfection and then stuffed with a medley of cheeses, cilantro, green onion and spices. 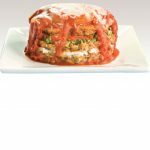 We finish it off with a delicate layer of low-cholesterol egg whites (just like the original relleno made in Central Mexico) and cover it in a savory sauce. ¡Delicioso!